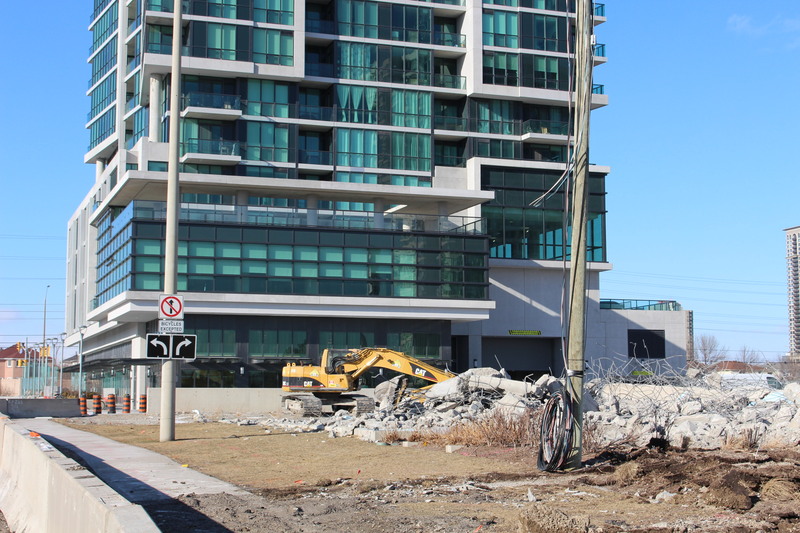 Grand Park 2 will eventually rise 48 storeys, making it one of the taller condos in Mississauga. There will be 469 units, and completion is planned for 2017. Architects are Turner Fleischer. 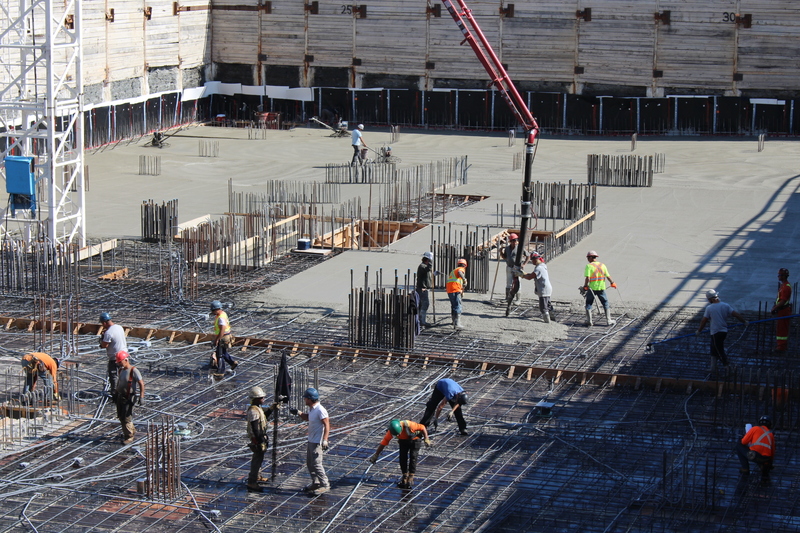 Lots of teamwork involved here with the crew, as some prepare the rebar, and others pour and work the concrete. 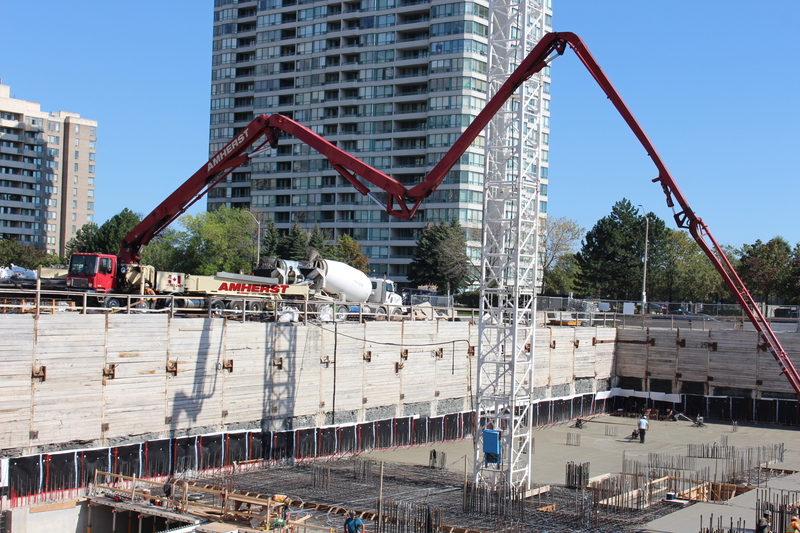 You can clearly see the vast size of the undertaking – there is an enormous amount of concrete and rebar on display, and this is just for the underground parking structure! Pinnacle’s Grand Park 2 condo tower is one of the dozens of highrise projects which are dramatically changing the downtown core of Mississauga City Centre. 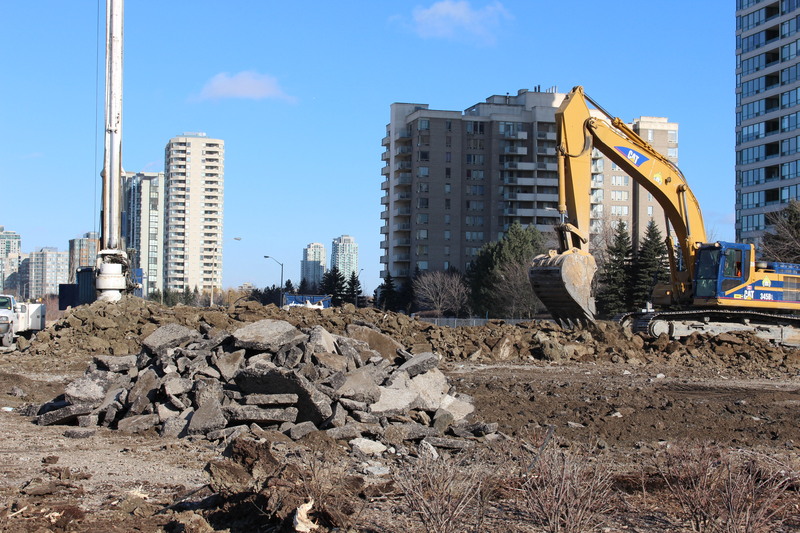 Late last week equipment arrived onsite, the sales office was quickly demolished, and ground work preparation commenced for the 48 storey Pinnacle Grand Park 2 condominium at Mississauga Square One. 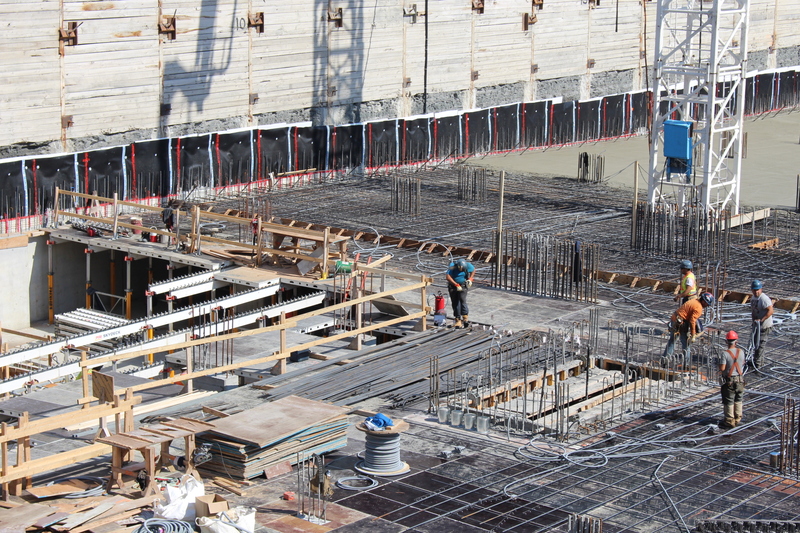 We note the presence of a shoring rig! It should be interesting to watch this building go up. Located at the extreme western edge of the Square One area, at the intersection of Webb Drive and Grand Park Drive, it is considerably taller than its sister tower Grand Park 1, and it will make a dramatic impact as the concentration of high rise condos stretches westward in Mississauga City Centre. Location is pretty good, as it is still walkable to Square One, plus it is directly across the street from the Grand Park shopping plaza, which houses a Shoppers Drug Mart, Winners, Staples Business Depot, Mr. India grocery, several restaurants and other stores. Come to think of it, it is also walkable to the massive T&T Chinese supermarket at Grand Park Drive & Central Parkway. Interesting new video showing the pending construction of the Massey Tower condominium, located on Yonge Street in downtown Toronto…. CityGate condos, located at 3939 Duke of York Blvd in Mississauga, was the first tower to be built in the Square One area by Toronto developer Davies-Smith. This 34 storey point tower won several awards for its architecture, and today is a popular and sought after address for Mississauga condo dwellers. CityGate has gained a reputation as a well run building, with excellent facilities, location, and solid real estate activity in both sales and rentals. CityGate was the first condominium tower to offer loft residences in Mississauga, in addition to regular apartments, and it also offers a generous array of amenities – 24 hour concierge, swimming pool, sauna, hot tub, yoga and gym rooms, party room, and a rooftop deck area on the podium which has BBQ facilities, to name just a few. My review covers prices, history and features of the property, walk score, and much more. See my main site for the full article on CityGate condos.